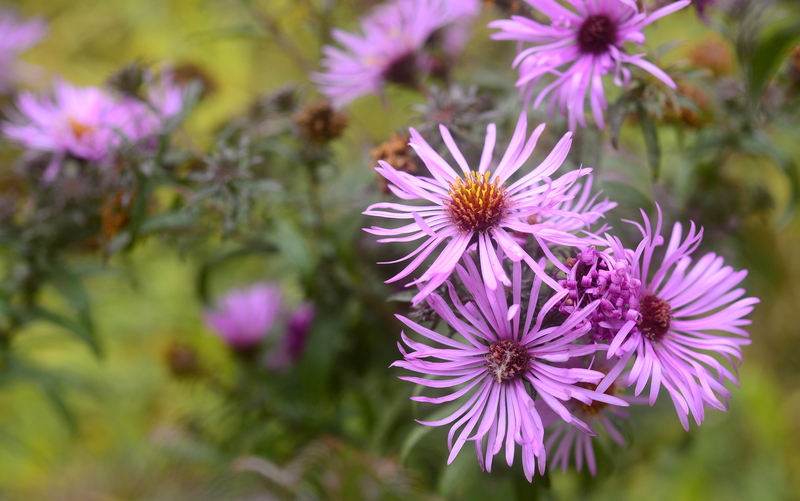 Most perennials have finished blooming and setting seed, but on sunny days bees and other pollinators are still enjoying the New England asters. — water new plantings: newly installed plants still need watering. Any week in which we receive less than an inch of rain (not this week, obviously! ), continue to water all perennials and woody plants installed this season. How do you know when you’ve provided an inch of water? An old yogurt container placed on the ground among the plants makes a great rain gauge. A tunafish or catfood can works equally well. — Tend the fall vegetable garden: if you seeded second crops of cool-season plants like peas, lettuce, and spinach, you’re probably harvesting now. We could get a killing frost at any time, so keep harvesting. We have been enjoying a delicious fall crop of arugula. — this is a good time to extend a garden bed or start a new one, and it’s always a great idea to eliminate some lawn: spread a 3-4″ layer of cedar or hemlock bark mulch over the area to kill the grass. Next spring, you’ll be able to plant right through the dying grass and mulch. I mulched an area of lawn during the summer and am scattering perennials seeds there as they ripen. — Now that you can water, there’s time to reseed bare areas of lawn. Most lawn grasses will grow until the temperature dips below 40 degrees. But if you seed, water several times a day until the grass is at least an inch tall. Better still, if you have a place where grass won’t grow, plan to plant something that will, like shade-loving native perennials. Measure and mulch the bed now so you’re ready to plant in spring. — Keep a garden log. Right now, before you forget, write down this year’s gardening successes and failures as well as plans for next year. The best thing about gardening is that there’s always next year. And get out there and enjoy the autumn colors. The fall foliage is at its most colorful in our area right now, and the weather is perfect! 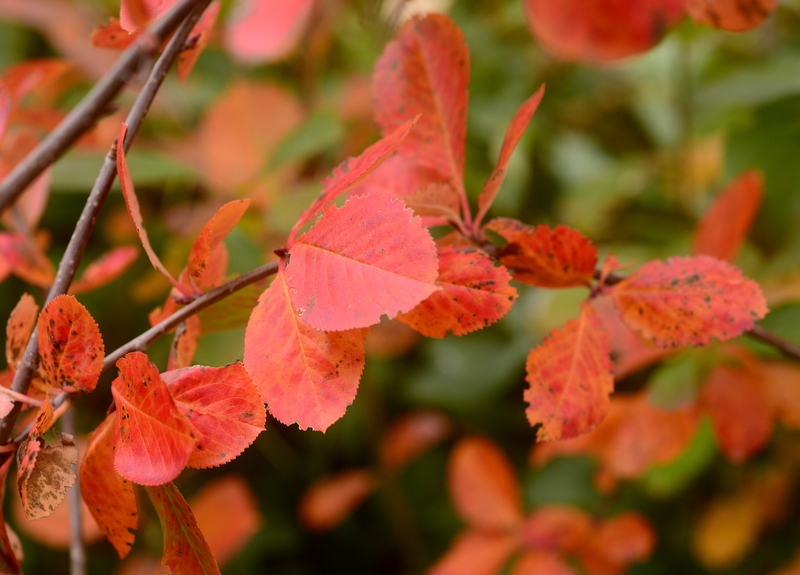 The fall colors of Aronia are highly variable. This year, one of my plants is displaying this gorgeous orange. 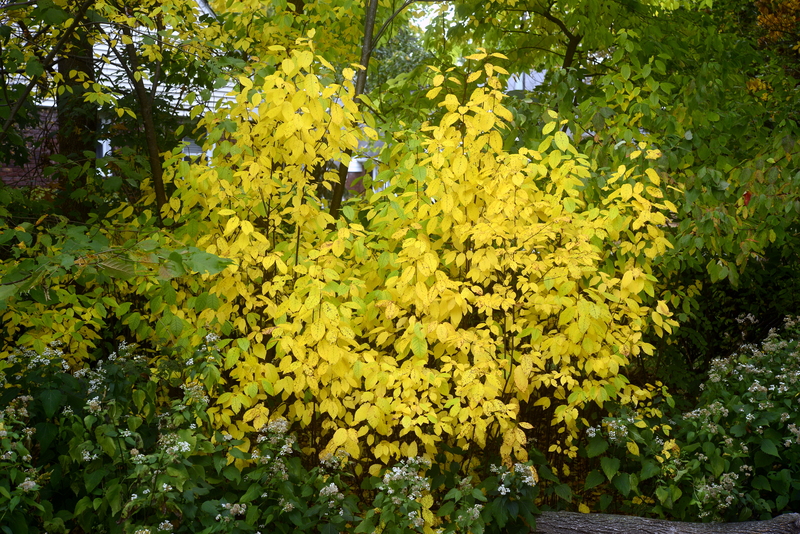 Chokecherry (Prunus virginiana) is displaying a lovely clear yellow color this year. This mid-sized tree is an excellent wildlife plant, like all cherries, but its tendency to form thickets makes it difficult to use in most gardens. You have to give it room to spread. 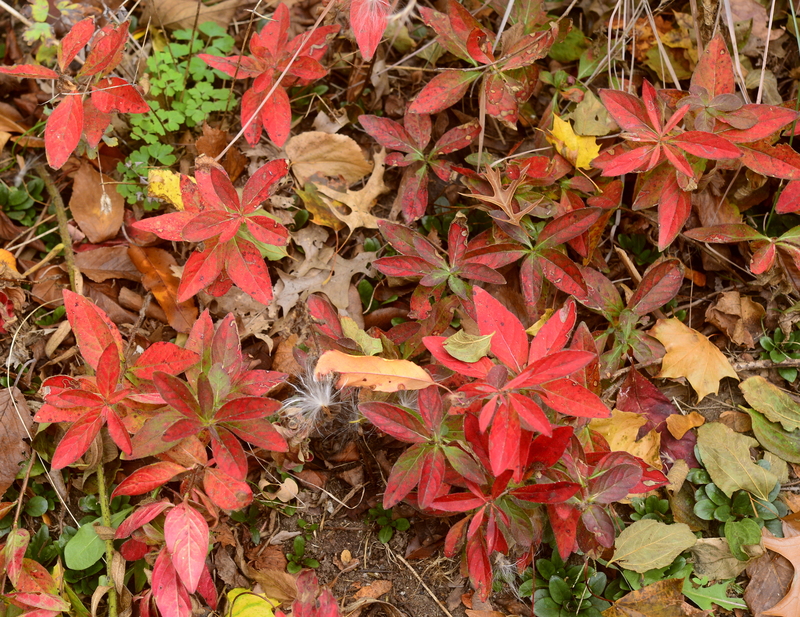 Many native perennials provide a second burst of garden interest in the form of vivid leaf color. The bright red is sundrops, Oenothera fruticosa. 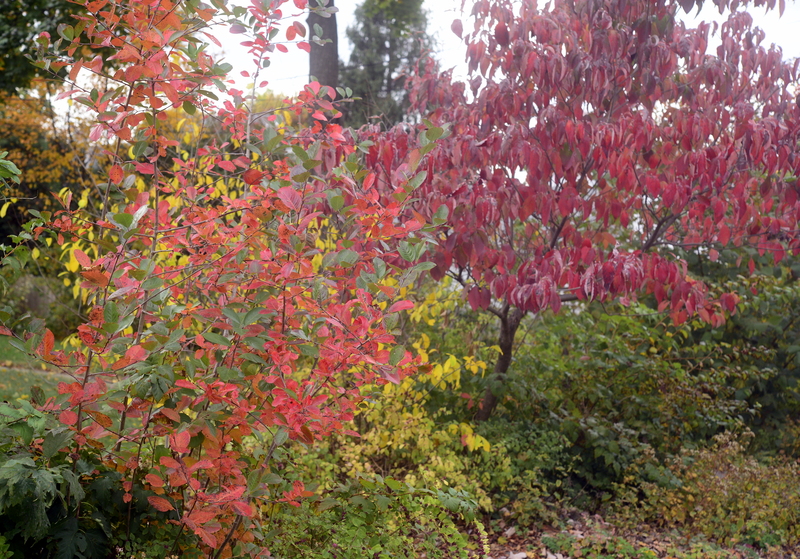 From left to right: orange chokeberry (Aronia melanocarpa), yellow spicebush (Lindera benzoin), and dark red flowering dogwood (Cornus florida). A detailed look at those chokeberry leaves. 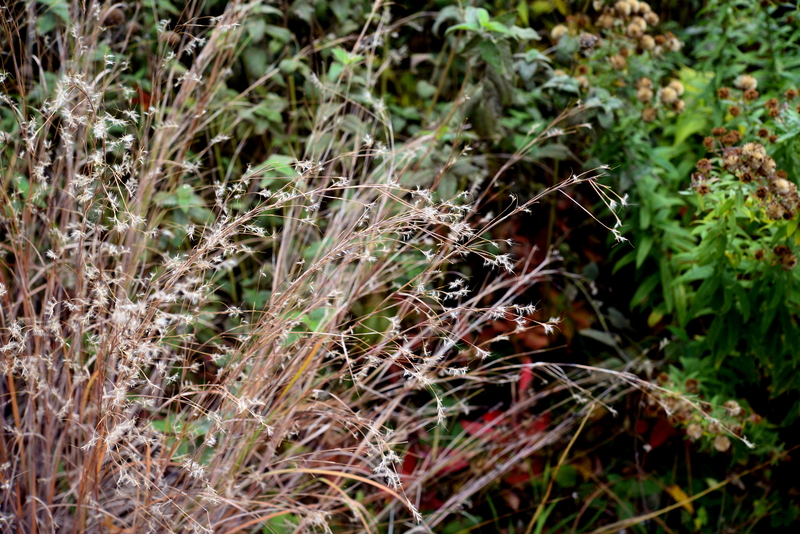 Seeds of little bluestem (Schizachrium scoparium) turn a tranclucent silver in the autumn sunlight. After the birds eat them, the stalks will turn pink and remain through the winter. 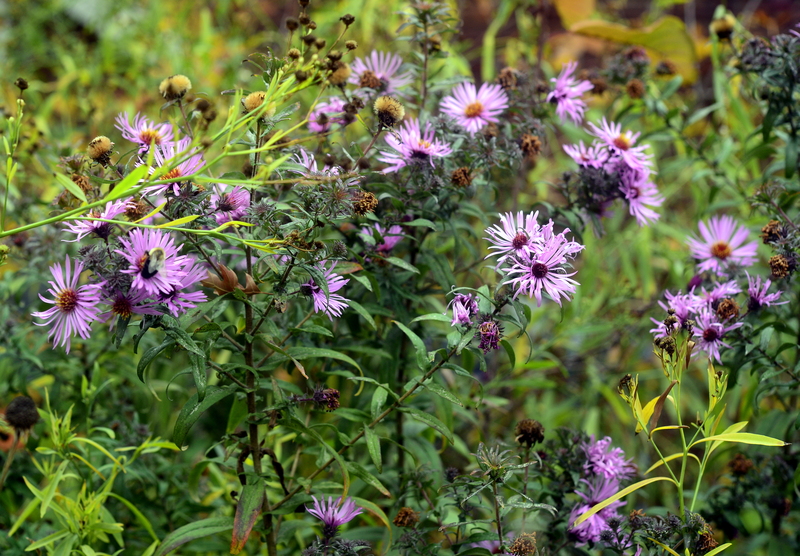 Most perennials have gone to seed, but New England aster (Aster novae-angliae) will continue to bloom for a few more weeks. 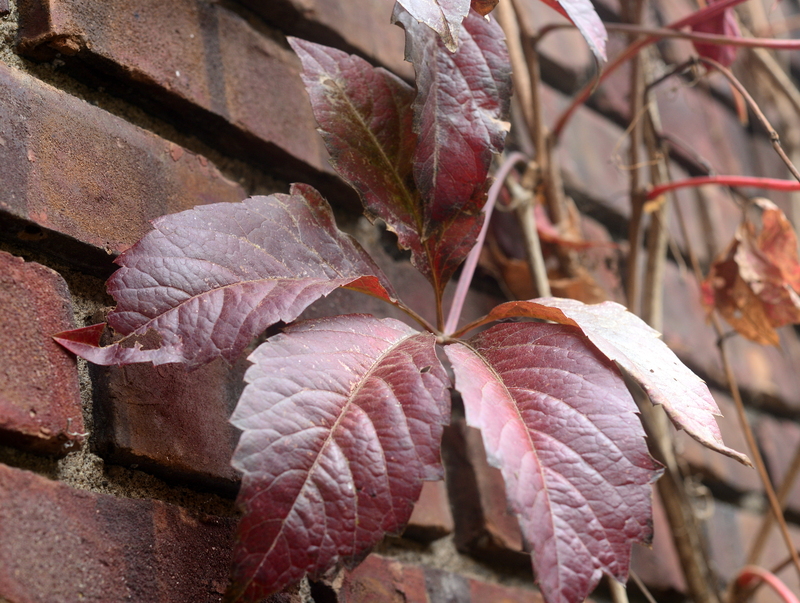 Virginia creeper (Parthenocissus quinquefolia) never fails to delight. 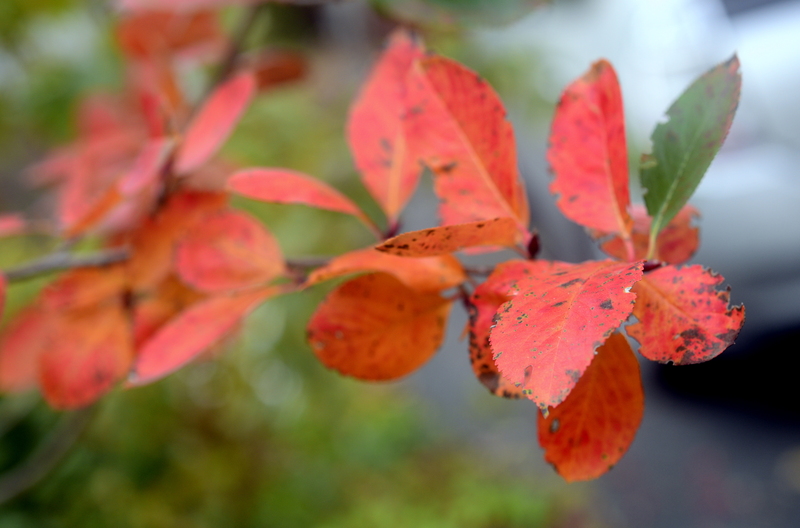 Its autumn color is usually a brilliant orange red, but right now, the few remaining leaves are a deep russet. These photos were all taken yesterday. Enjoy the bright colors on this dark, rainy day. And remember how badly we need the rain!